It is not often that a neglected or forgotten artistic treasure is rediscovered. But it happened recently at a theatre in New Brunswick, N.J. – a concert version, with full orchestra, of Joseph Rumshinsky’s 1923 musical comedy Di Goldene Kale (The Golden Bride). This joyful, melodically blessed operetta was co-presented with Mason Gross School of the Arts by another treasure, the National Yiddish Theatre Folksbiene, the oldest continuous theatre in New York. Founded in 1915 on the Lower East Side, the theatre is now celebrating its centenary. Di Goldene Kale’s plot is above the usual standard banal fare of Yiddish plays: it involves a young woman who is heir to a fortune and now has several suitors after her and her money. But she loves Misha and ends up with him, after the usual ups and downs of musical comedy narrative. Rumshinsky (1881-1956), one of the giants of Yiddish theatre during its heyday in the 1920s and ’30s, continued to work and compose until the year of his death. His operetta is full of memorable tunes, which the audience took to immediately. His musical traditions include influences from the Yiddish theatre, American musicals, European operettas and American popular music, most notably the opening chorus of George M. Cohan’s 1917 First World War song, “Over There.” Yiddish theatre was known for having at least one joyous religious occasion onstage, often a wedding, which nostalgically brought back an aspect of traditional Yiddishkeit to now-secular Jews, who were usually watching the performance on a Friday night, and Di Goldene Kale has a very moving Friday night Kiddush, a lovely melody that the soloists and chorus expand via theme and variations. After its 1923 première, Di Goldene Kale toured the United States, Europe and South America. It was still being performed as late as 1948. The Aug. 5 show at Nicholas Music Centre was the first performance in Yiddish (with English and Russian supertitles) and full orchestra in 70 years. The stunning cast was led by the gorgeous operatic voice of Dani Marcus, who plays Goldie, the goldene kale, and the fine baritone, Eyal Sherf – a trained cantor – who plays her boyfriend, Misha. The producer and director was Motl Didner, and Michael Ochs edited the orchestral score from manuscripts dating back to the 1923 première. National Yiddish Theatre Folksbiene artistic director Zalmen Mlotek conducted the young, attractive cast, all seasoned in singing, acting and comedy. To find first-rate singers who also act superbly and know Yiddish was a minor miracle and a major achievement. At the show’s end, the full house stood up and applauded. The orchestra and cast then reprised one of the operetta’s songs and everybody went out singing. 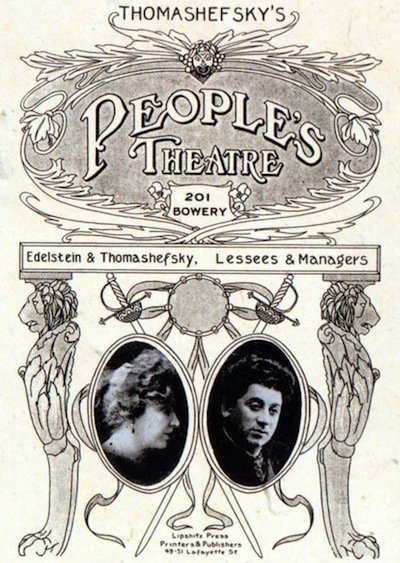 Classical American Yiddish theatre was also recently the subject of a program hosted by Michael Tilson Thomas, music director of the San Francisco Orchestra, who celebrated the career of his legendary grandparents, Boris Thomashefsky (1868-1939) and Bessie Thomashefsky (1873-1962), who were illustrious Yiddish theatre personalities. Titled The Thomashevksys: Music and Memories of a Life in the Yiddish Theatre, the show included four singer/actors and members of the Boston Symphony Orchestra at Tanglewood playing selections from Yiddish theatre music. By speaking Yiddish I wanted a) to know if he understood Yiddish and b) to separate myself from a group of people near him. Born in 1944, Thomas – his father shortened the original name – never met his famous grandfather, but the conductor told me that Grandma Bessie spent her old age near the family in California. Since she lived to be 89, she was a presence in Michael’s life until he was 18. When Boris’ infidelities became too intolerable, Bessie simply walked out on him in 1912 (she never did divorce him) and opened a rival theatre and became a success on her own. “My grandmother used to say of her marriage to Boris: ‘We were a mistake – but a beautiful mistake,’” shared Thomas. One of the most touching of personal anecdotes is Thomas’ strudel story. The Tanglewood program also included a slide show that added lustre to the narration and a brief clip from the only film that Boris ever made, wherein he sings a Yiddish song. Along with sparkling orchestral numbers, the conductor and four singers offered musical selections and scenes from the couple’s real-life drama. When Franz Kafka, early in the 20th century, brought a Yiddish troupe to Prague and told his audience, “Ladies and gentlemen, you know Yiddish better than you think,” he may have had the Tanglewood audience in mind for, with every Yiddish joke, most of them broke into laughter. The highlight of the program was Thomas singing the once-popular song “Thomashefsky,” about the actor himself. The conductor pranced on stage, doing all the riffs and gestures of a veteran Yiddish music hall star, with the song’s memorable refrain, “Who do you think is going to marry my sister?” No doubt Grandma Bessie’s spirit was guiding her einikl in performing this enchanting song. Curt Leviant’s most recent book is Zix Zexy Ztories. His ninth novel, King of Yiddish, will be published in December.